From the queries we see and from our own personal experience, it’s clear that finding information on European river cruises that cater to travellers with mobility problems was not an easy task in the past. 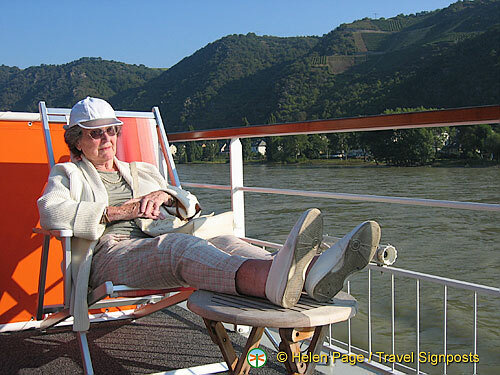 In 2005 when we took my 89 year-old mother-in-law (Barbara) on the Amsterdam to Budapest river cruise, none of the river boats (including the fairly new ones at that time) had elevators and the only access from deck to deck was via the stairs. Although Barbara was not wheelchair-bound, she could only walk slowly and climbing steps was difficult for her. We overcame the problem as best we could by booking her a stateroom that was on the same level as the restaurant. Her stateroom also had French windows so if she didn’t feel like going on the sundeck, she was still able to enjoy all the views along the river and the sunshine from the comfort of her room. To get up to the sundeck or down to the reception, we helped her along, taking things quite slowly so she felt comfortable making those trips. 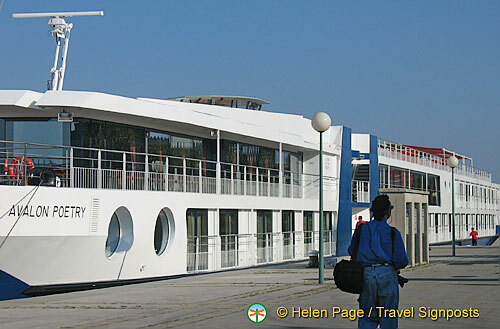 Many ocean cruisers have cabins that are equipped with facilities for wheelchair-bound travellers, but river boats generally do not have them. Understandably, river boats are much smaller vessels than the ocean-going ships and space is an issue. That was in 2005, and it’s good to see that many of the modern river boats now have elevators, however this still does not solve the problem for travellers who are wheelchair-bound as the cabins are not “wheelchair-accessible”. 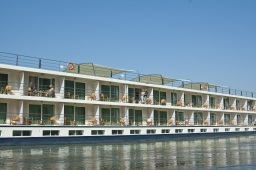 One river cruise operator, I checked with (Scenic Tours) confirmed that all of their ships feature elevators and have wheelchair-accessible cabins. Note that Scenic Tours have one of the most advanced fleet of river boats which they call “space-ships”. The MS Scenic Ruby, Scenic Diamond, Scenic Emerald and Scenic all feature outside balconies, whereas many of the other river boats would only have French windows, if at all. Scenic has a beautiful Junior Suite (Suite 302 on the Sapphire, Emerald, Diamond, Ruby) with a balcony which has wheelchair facilities for wheelchair- bound passengers. This suite is close to the reception and near the lift. The doors have been widened to allow access by a standard size wheelchair. The space in the room allows for easy manoeuvring of a wheelchair and there is a power point next to the bed. You can enjoy the view from your private balcony although there is a small lip onto the balcony level. There is a wheel-in shower and a stool provided for showering as well as a rail on the wall for further assistance. Lifts – Unlike a lot of river cruising ships the lifts on Scenic’s ships have access to the two main decks and this provides full access on these two decks which have reception, restaurants, shop, bar and lounge. Only the top outside deck, the Moselle deck and the Wellness Centre (including the hairdresser) are not accessible by the lift. Wheelchairs – Passengers confined to their wheelchairs must provide their own collapsible chair. It should be noted that only standard size wheelchairs can be accommodated on board. Apart from the specific wheelchair-accessible cabins, all other cabins cannot be accessed by a wheelchair. Uniworld does not have handicapped or wheelchair-accessible cabins. There are elevators on the River Princess, River Queen, River Empress, River Duchess and River Countess. On the River Queen, the elevator does not reach all decks. Although these boats have elevators, we noticed on our 2013 trip on the River Princess that the elevator is hidden away and used for movement of baggage and supplies only. Avalon/Globus do not have wheelchair-accessible cabins. There are elevators on the Avalon Affinity, Creativity and Scenery only. Viking does not have wheelchair-accessible cabins. Of their huge fleet, only the Viking Danube and Viking Sky have elevators. So if you’re looking for a European river boat with wheelchair-accessible cabins, Scenic Tours are the best equipped to cater for passengers with disabilities and mobility challenges. At least there is now one European river cruise operator who provides for travellers who use wheelchairs. river cruising involves a fair amount of shore excursions and in the old towns of Europe, most of these walks are along cobbled streets. If participation in the shore excursions is important to you, make sure that you discuss your personal circumstances with the river cruise operator to make sure that there will be no issues with your travel. in the early days of river cruising when there were less boats plying the rivers of Europe, our riverboat was mostly moored close to the towns that we stopped at. In 2013, when we travelled from Vienna to Paris, our boat was more often than not moored a distance from the historic centres. In Bamberg and Wurzburg, we were moored at the industrial port. There was quite a walk into town at Deggendorf and Wurzburg and at other destinations where it was too far to walk, we were transported in by coach. The moorings close to the centre are still there, but it may be that they are more costly now. If sightseeing is important to you, check with your cruise operator how accessible the towns are to the moorings they will be using. you need to make sure that the person you are travelling with is able to help you with all your physical needs like lifting your wheelchair, etc. River cruises generally operate with a smaller crew than the ocean cruises and they do not have staff available to personally attend to passengers with mobility problems. Even though Scenic Cruises told me that they have a suite equipped for physically challenged passengers, when one of our readers rang them, he was told that none of their cruises are suitable for wheelchair dependent travellers because of the limited access on the gang planks. be aware that river cruising is now a very popular form of travel and when there is more than one boat in port, the boats could be moored alongside each other. If your boat happens to be the one that is moored away from the landing pier, then passengers are required to walk across gang planks through the lobby of the other ship before getting to the landing pier. At one of the ports that we arrived at in July 2013, the ship closest to shore did not allow passengers to walk through their lobby. Instead we had to climb to the top deck and then climb down the other side to get to shore. Be aware that this could happen to you. Again, as people have different degrees of disability, it is worthwhile having a chat with the river cruise operator to discuss your personal situation. The good thing about cruising down the Rhine, Danube or any of the European rivers is that the scenery is spectacular and you actually see a lot from the river boat. So even if you can’t do many shore excursions, river cruising in Europe is still very enjoyable and worthwhile doing. Having just returned from a Viking Waterways cruise in Russia with my partially disabled sister, I would not recommend this type of holiday to anyone who relies on a wheelchair, whizzer or walks with canes. Even though the Cruise company will tell you that you can bring your wheelchair or motorised scooter on board, but there might be ‘challenges’, there are too many barriers for disabled people. No matter how accessible the cabin or the shower, getting on and off the boat is a nightmare, especially when two or three are moored alongside each other and one has to negotiate over raised doorways, gangways with gaps and steep steps and gangplanks. None of the buses used for our excursions were adapted for wheelchair users (no lift, ramp or hoist). Most of the palaces, churches, monuments, theatres etc are not accessible and do not have lifts (elevators). All have flights of stairs into the buildings and more staircases inside. Few of the towns or viallges we visted had ramps on and off sidewalks, at intersections or at pedestrian crossings. At some places – Uglich comes to mind – there were fights of steps leading up to the promenade from the pier -with no ramp for a wheelchair. Many places in Russia have cobblestones roads and squares (eg: Red Square) which are definitely not wheelchair freindly! Amawaterways are launching the Amakatarina next year and claim to have wheelchair friendly cabins etc. That is fine if you want to spend 10 days in a floating hotel but are restricted to the boat and are unable to enjoy the many excursions and tours included in the price. I wonder how much walking is involved on the excursions. I can climbs stairs and walk well for short distances, but can’t walk for distances. Does anyone know about this? I dream of going on one of these riverboat cruises. Thanks for the info. I’m considering taking my 83 year old neighbor on a cruise but wondered how it would work. Wes, many of the river cruise operators now have DVDs that will give you and your neighbour an idea of what river cruising is about. As mentioned in the post above, river cruising offers passengers the opportunity to explore many of the towns and villages along the rivers in Europe. And if you want to see these places, it involves a fair amount of shore excursions and walking on cobbled streets. If your neighbour is wheelchair-dependent, you’ll need to consider if you are able to participate in the land sightseeing. Whereas most cruise operators are very good at looking after passengers when they are on the boat, it is not their responsibility to push wheel-chair bound passengers around the sights. I suggest you discuss your neighbour’s mobility issues with whichever company you are considering a cruise with and take their advice on what’s possible. You’ll also need to consider how you will manage your travel before and after the cruise. While my mother-in-law thoroughly enjoyed her river cruise, and we were pleased that we took her on a couple, it did involve a fair bit of work on our part. thank you for all this info – my husband & I are thinking a gong with Scenic, but you have to pick your itinerary well before you depart your cruise. What happens if you change your mind too bad. I also have limited mobility & can only walk for a short while & then need to stop, so what happens there as. I don’t want to be a burden on everyone else. Viv, the river cruise companies run information sessions where you can find out more about the cruises and discuss with the consultants as to which cruise you will enjoy best. Scenic is currently running one for their 2014 cruises and if you can you should try and attend one. On the cruises, they usually give passengers a program of the next day’s activities. You can discuss with the tour director which excursions you are able to participate in and which ones you would prefer to sit out of. You’ll find that most of the tour directors and staff on the cruises are very helpful. They can tell how much walking is involved at each stop and make suggestions on what you can do. I would really recommend that you try and attend an information session so that you can discuss your needs with the company before you decide. My wife and I are interested in a European river cruise but she is a total paraplegic confined to a wheelchair. Although you mentioned that one of the cabins on the Scenic tours boat is wheelchair accessible, when I contacted them they didn’t believe wheelchair dependant people would be suitable to any of their cruises. They listed very poor access through the boats, and vertually nil access to and from shore due to steps, and width of gang plank. Once ashore very limited access due to steps and stairways to any of the sights, and now wondering if this is all worth while. We would be travelling on our own, and relying soley on the good nature of other passengers/crew for assisstance. Is all this true, or some sales assistants don’t know their product. Apologies for the late reply as we’re currently on assignment in Paris. When you purchase a river cruise, what you’re paying for is the cruise itself and the many shore excursions. As your wife is totally confined to a wheelchair, it would be very difficult for her to participate in the shore excursions and you would therefore not be getting value for trip. The reasons given by Scenic are correct. Because river cruising has become so popular these days and the number of river boats have increased significantly in recent years, what commonly happens at each river port is that the boats are lined up alongside each other. If your boat happens to be away from the landing pier, then you’d have to step through narrow gang-planks of the other boats to get to the pier. In your wife’s situation, It would be difficult to navigate the gang planks of the other boats to get her across to shore if yours is not the only boat at the pier. As you may be aware, many of the old towns in Europe have cobbled streets and this is another reason why it would be difficult for you alone to wheel your wife on the walking tours. Unfortunately, because of the limitation of the size of the riverboats, most companies aren’t able to cater for disabled travellers and it is correct that Scenic should warn you of the difficulties, even though they do have a wheelchair-accessible cabin. Having brought my mother-in-law on a few trips, I can speak from personal experience that it was hard work for my husband and I, and you and your wife may prefer not to put yourself through the stress. Have you considered coastal cruises? Thanks Helen for your very helpful and sound advice. Unfortunately it doesn’t seem feasible for us to travel to Europe anytime soon. We have considered coach tours, but organising and relying on disability access with accomodation, coach access, and sightseeing venues would be a nightmare. There are some tours that do cater for wheelchairs, but my wife’s condition means she needs to lie flat for the majoity of the day, where the river cruise would have been ideal. We have been on the Pride of America, Hawaii, and she thoroughly enjoyed it, so we may do something similar again. FYI – Reserved a Cruise and 2 months later I’M hospitalized and Oxygen. Wanting the cruise, I’ve found online a number of companies that offer international cruise/travel support. At least one has done business for +12 with European River vendors (who – don’t know). Key is What Line, ship, Departure/Off Load City & Dates. I’m still opitimizic I won’t have to cancel it – I want my wife to have it ! Thank you for sharing your river cruise experience. I’m so glad that inspite of your mobility problems you gave it a go and had a great time. It sure beats staying at home!! I hope you’re planning for your next cruise.